Since moving to the U.S. in 1999 I have eaten a lot of burritos. A lot. As delicious as they are, they are highly responsible for my irresponsible weight gain as I went from college, home-cooked meals and almost daily basketball practice to join the workforce, eat take-out and lounge around watching TV. And burritos. So, I think I know burritos. And one of my favorite all-time burritos comes not from a hole-in-the-wall restaurant in a distant neighborhood but from a fast-food chain with more than 800 locations across the U.S.: Chipotle. They are invariably fresh, tasty, well-packed and properly packaged. Aside from the upstanding quality of the burrito they serve, Chipotle stood out as a comfortable and eccentric setting to enjoy a burrito, with its funky art, weird furniture and aluminum siding decor. And, even, its Papyrus-like logo stood out from the fast-food norm. Actually, I didn’t even notice when they switched away from it and into the circle logo shown in the image above, which has evolved into a new identity designed by San Francisco-based Sequence. Way back in August of last year I received an e-mail from an insider with some snippets of the new identity taken from a set of brand guidelines being distributed to employees at the time. That was more than eight months ago. This should help shed light on how long in advance these identities are regularly developed, and they are not just whipped out from a magic hat in two months. But I digress. At the time, there was no news about the redesign, and I’ve made it a policy to not “leak” logos, it’s not what we are here for and it’s a disservice to the product or organization and the designers. So I sat, and I sat, and I sat, (and I ate some more burritos), and finally the new identity is beginning to be rolled out by Chipotle. 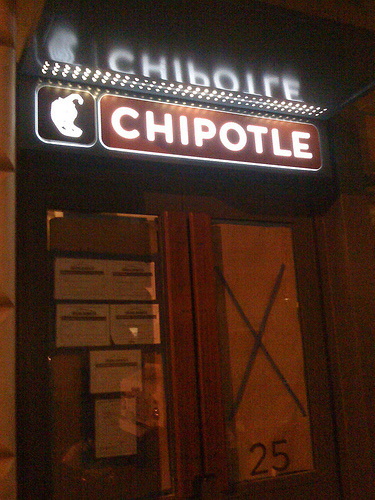 New York location in the works, spotted by Flickr user (and designer) shalin1. As an extension of the previous medallion, this is on the surface an improvement, but as it relates to the experience of eating at Chipotle, it is not. The previous use of Bank Gothic, while odd, matched the industrial look of the restaurants and felt more hard-core than the new rounded sans serif with the weird low middle bar on the “E” that makes it look needlessly retro. I have not much positive things to say about the old drawing of the chipotle pepper, it wasn’t very appetizing or discernible but at least it didn’t look like the dingbat companion to the 1990s’ Fajita. The new pepper feels too much like clip-art but, on the flip side, the “food with integrity” medallions are actually quite nice, fun and cohesive. To be perfectly honest, as long as they maintain the quality of the burritos they can draw the chipotle pepper any way they like, and if the ambience of the locations does not change to some 1950s diner decor, I will keep volunteering my waistline to their business. Thanks to an unnamed employee for first tip and to JJ at Graphicology for finding the design firm who did it. \n\nSince moving to the U.S. in 1999 I have eaten a lot of burritos. A lot. As delicious as they are, they are highly responsible for my irresponsible weight gain as I went from college, home-cooked meals and almost daily basketball practice to join the workforce, eat take-out and lounge around watching TV. And burritos. So, I think I know burritos. And one of my favorite all-time burritos comes not from a hole-in-the-wall restaurant in a distant neighborhood but from a fast-food chain with more than 800 locations across the U.S.: Chipotle. They are invariably fresh, tasty, well-packed and properly packaged. Aside from the upstanding quality of the burrito they serve, Chipotle stood out as a comfortable and eccentric setting to enjoy a burrito, with its funky art, weird furniture and aluminum siding decor. And, even, its Papyrus-like logo stood out from the fast-food norm. Actually, I didn't even notice when they switched away from it and into the circle logo shown in the image above, which has evolved into a new identity designed by San Francisco-based Sequence.